Determine the spring constant of the spring. Determine the weight of the wood block. Determine the force of kinetic friction between the wood block and the carpet square. Determine the coefficient of kinetic friction between the wood block and the carpet square. 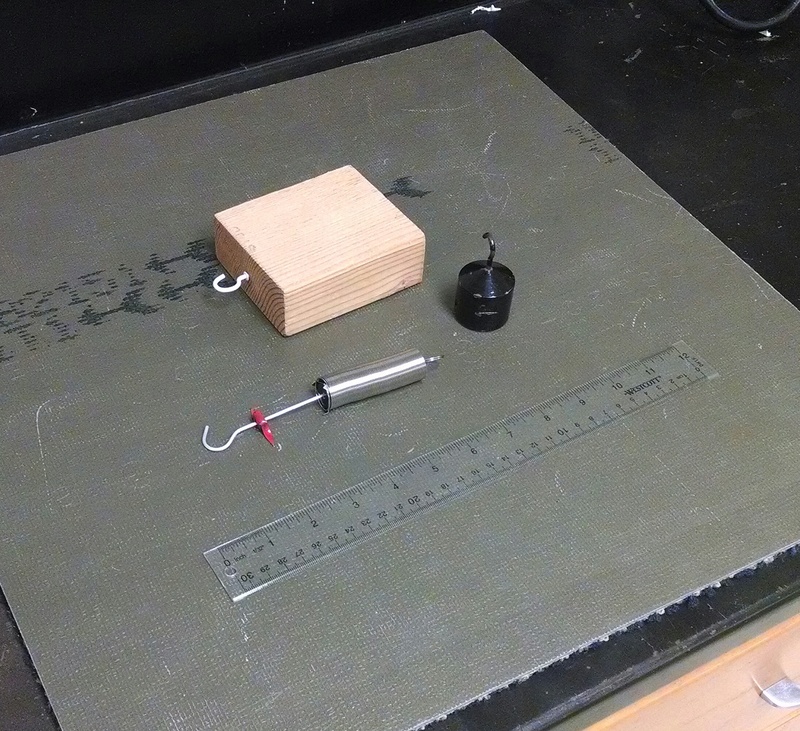 Predict the force of kinetic friction when a 500-gram mass is added to the wood block. I like it because it ties together almost all of the force laws we’ve been working on: spring, gravity, friction, and normal. It was a bit of struggle for some, particularly when reaching for an equation is seen as the first line of action. But without the struggle, there’s no growth. Many of the prediction were really close. One problem we ran into was that the wood didn’t slide smoothly over the carpet — it was more of a slip-stick motion. So for my last class I asked them to use the rubber side of the carpet square instead, which was much better. If you wanted to make it more challenging, you could remove the scaffolding (Tasks 1 through 4) and just ask them to make the prediction in Task 5.